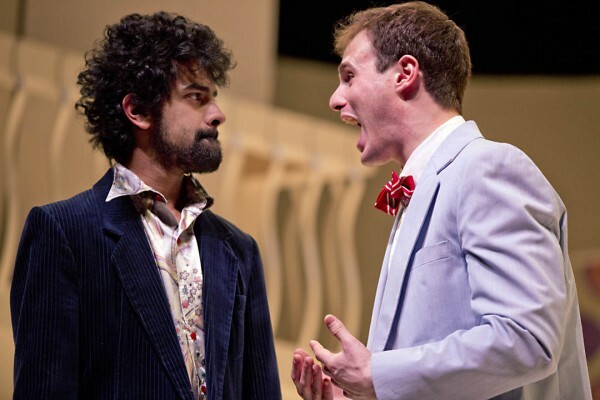 Nikhil Krishna ’13 as Proteus hears a mouthful from a Sam Metzger ’14 as Valentine. Photographs by Phyllis Graber Jensen/Bates College. 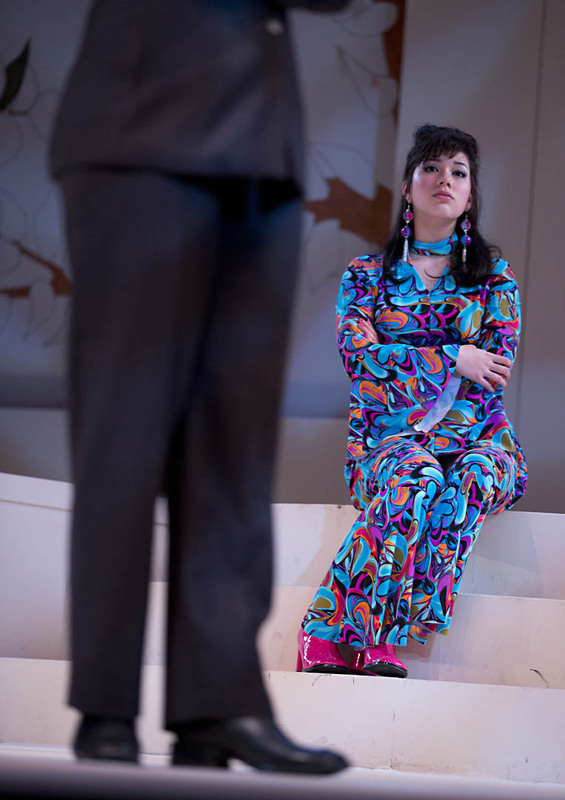 Bates presents The Two Gentlemen of Verona, a romantic comedy considered by some to be Shakespeare’s first play, in performances at 7:30 p.m. Thursday through Saturday, March 7-9; 2 p.m. Saturday and Sunday, March 9-10; and 7:30 p.m. Monday, March 11, in Schaeffer Theatre, 305 College St. Admission is $6, and $3 for seniors and students. Tickets are available at batestickets.com or by calling the box office at 207-786-6161. Silvia is played by Singha Hon ’14. The storyline is driven by the romantic impulses of two young couples: Julia and Proteus, and Silvia and Valentine, who is Proteus’ best friend. The fickle Proteus and coy Julia stir up a colorful plot — involving cross-dressing, a scene-stealing dog and a band of woodland outlaws — that works out happily for all in the end. The themes of romantic love and friendship found here are ones that Shakespeare would return to later in such works at Twelfth Night and As You Like It, says Andrucki. Sixteen students will perform in the Bates production. Portraying Proteus is Nikhil Krishna, a senior from Concord, Mass., who is performing as part of a senior thesis. Sam Metzger, a junior from Wellesley Hills, Mass., plays Valentine; Allie Freed, a first-year student from Magnolia, Mass., is Julia; and Silvia is played by Singha Hon, a junior from New York City. The production features original music by Vonetta Trotter, a senior from New York City, who composed a setting for Shakespeare’s famous lyric “Who is Silvia?” Krishna will sing the piece. Andrucki notes that his production is transposed to the late 1960s, an era marked by social upheaval that meshes with the setting of the play. 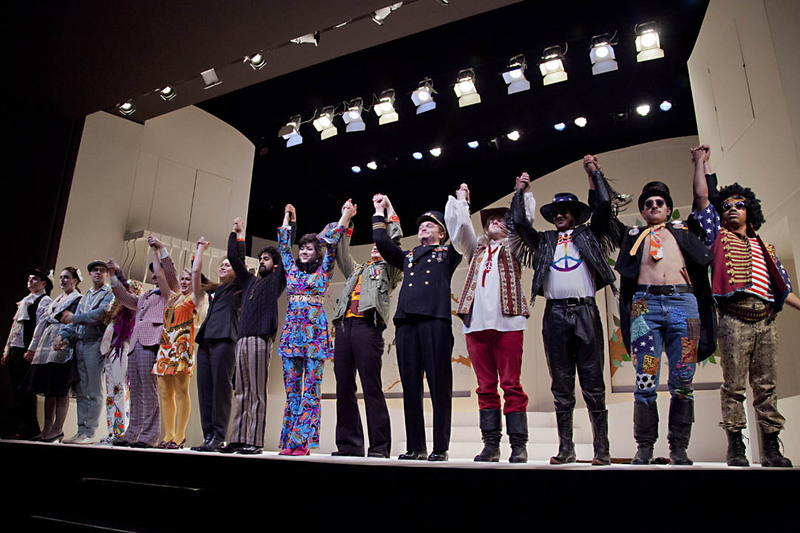 Wearing costumes designed by Carol Farrell, the cast takes a bow during a dress rehearsal. Unlike other plays by Shakespeare, he adds, The Two Gentlemen meets college students where they are in terms of life experience and outlook. “The characters are the same age as our students,” Andrucki says. “The kinds of emotional experiences they go through will be familiar to students — intense friendship, intense infatuation or love, and betrayal of friendship through love.